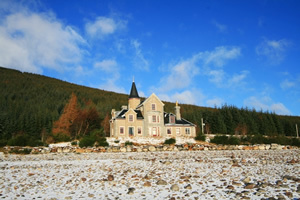 Luxury Holiday Lodge in Highlands Scotland a perfect base for your holiday in Inverness-shire. Find out more about Luxury Holiday Lodge below. Well-appointed, characteristic lodge in a picturesque setting on a 34,000 acre estate. Luxury accommodation over three floors sleeping up to 8, with spectacular views from the main reception rooms and bedrooms. Finished to a high standard with wooden floors, carpeted bedrooms and period antiques, a comfortable house to come back to and relax after a day out. Warmed in the cooler months by central heating and log fires.Within;-Beautiful interior, modern day living combined with an Edwardian theme-Accommodation made up of 4 bedrooms and 3 bathrooms-Plenty of space downstairs with two reception rooms, dining room and fully equipped kitchen-Trout fishing from the bank is included within the rental -External Kennels availablePerfect for:One to two families, mixed couples, fishing groups looking to enjoy each others company in a stunning setting.Please note: Pet charges may apply. Luxury Holiday Lodge is family friendly self catering. We have the following details listed regarding Luxury Holiday Lodge accommodation accessibility but we would recommend that you always confirm these prior to booking with the owner or operator. Luxury Holiday Lodge is a great base to explore the wonders of Inverness-shire and you will find plenty of activities near by. Luxury Holiday Lodge is at Dalwhinnie, Inverness-shire. The nearest train station is Dalwhinnie. The nearest airport is Inverness. Check out the map below for directions, use the controls to zoom in. If you have stayed at Luxury Holiday Lodge why not add your thoughts, comments, pictures to our Facebook page? Don't forget to add the name/town/page link to your comment so its attributed to the correct place. Please keep it polite, we are sensitive souls! Find Cottage Holidays works closely with independent cottage owners and leading holiday travel operators to provide you the widest choice of self catering accommodation across Scotland. Luxury Holiday Lodge in Inverness-shire is available through: Scotts Castles. Stayed at Luxury Holiday Lodge?